Li was born in the Canton province of China to a wealthy, patriotic family. She was given the nickname “Dandan,” a homophone for the Chinese word for “bomb,” because her family used her baby carriage to stealthily transport explosives. At age 14, she wandered onto a movie set, and the director was smitten with her stunning looks. He offered her the opportunity to act in a silent film, and she thought it would be fun. Despite her lack of experience, Li, using the stage name Li Dandan, quickly won the admiration of audiences, which she capitalized on for six more films. Her most famous role was the title character in Hua Mulan Joins the Army in 1928. Hua Mulan was the young girl who dressed as a boy to go to war, the basis for the Disney animated movie Mulan. In order to play the role convincingly, Li learned martial arts, archery, boxing, fencing and horseback riding. These new skills gave her an edge off the set as well and made her a hero to the production company. One night while they were on location, robbers snuck into the camp and stole the production money. 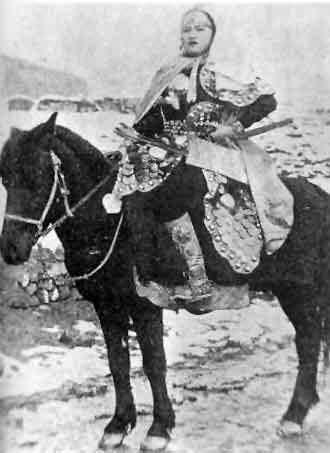 Li jumped on a horse, prevented the thieves from crossing a bridge, and after fighting with them for a while, tossed them over the bridge into the river. Li’s father wanted her to continue her education, so he sent her to Europe. He was also ready to pass off responsibility for her to a husband. He changed her name back to Li Xiaqing and hired a matchmaker. She picked Zheng Baifeng who was educated at the Sorbonne in Paris and worked for China’s Foreign Service. This seemed like a match made in heaven, and the couple was married in 1929 and made their first home in Geneva. Li was 17 years old and Zheng was almost 30. By 1932, Li had become a mother to a son and a daughter. This new responsibility did not, however, interfere with her love of travel. In 1933, Li attended the Paris Air Show and was enamored by flying. Immediately upon returning to Geneva, she enrolled in flying lessons. One year later, Li made her first solo flight and was the first woman to receive a private pilot’s license in Geneva. Li’s reason for learning to fly was patriotic: to help her country advance through aviation. In order to accomplish that, she needed to become a more proficient pilot and mechanic. She enrolled at the Boeing School of Aeronautics in Oakland, California for advanced training. By the time she graduated she could dismantle and reassemble an airplane engine and was versed in aerodynamics, meteorology, aircraft design and radiotelephony. The biggest thrill in flight for Li was aerobatics. On May 15, 1935 she went up with instructor LeRoy B. Gregg over San Francisco Bay. At about 2,200 feet Gregg started a barrel roll and turned the plane upside down. When he looked back, he saw Li falling out of her seat trying to hang on. Then, in shock, he watched her fall. After a free fall of about 900 feet, Li remembered to pull the rip cord and activate the parachute she was wearing. This eased her splash down into the icy cold bay. Li was an experienced swimmer, but her water-logged leather suit and the freezing water made it difficult for her to move. Gregg dropped life preservers, but Li couldn’t get to them. Luckily, airmen at the U.S. Naval Reserve Base in Alameda saw her fall and were on their way to rescue her in a Loening amphibious plane. Unfortunately, the pontoons were stuck on this aircraft, and Li had to continue to tread water until a second one could arrive. Li was in the water for 20 minutes until she climbed aboard the rescue aircraft. A credit to her gender, Li only had two complaints: she was cold, and she lost a shoe. In order to “get back on the horse,” Li went up over the Bay in the same stunt plane the following day. Apparently, the cause of Li’s involuntary ejection was a broken seat belt, although she admitted to a reporter many years later that it was possible she had forgotten to fasten it. This harrowing experience earned Li membership in the Caterpillar Club, an exclusive organization of about 100,000 people with only one requirement to join. You must have saved your own life through an emergency parachute exit from an airplane. On November 5, 1935, Li was the first woman to graduate from the prestigious Boeing School of aeronautics. With a diploma, private pilot’s license and impressive experience, she returned to China. In 1934, General Chaing Kai-shek authorized private flying in China for the first time. After passing a demanding test, Li was the first woman to be issued a government pilot’s license, handed to her by General Chaing himself. With this honor came responsibility. She was given the use of a government plane and charged with inspecting all the airfields throughout China. Li didn’t really have time for family, and didn’t live with her husband and children. This independence had consequences. In 1935 she divorced Zheng under the new constitutional laws which made Zheng lose face. As a result, Li had to forfeit seeing her children until they were adults. Li wasn’t at a loss for romance, however. She had met Peter Doo when she was in Europe and they corresponded while she was lived Oakland. With Li finally a free woman, Doo went to work for her father to encourage a commitment from her. The most she was willing to commit to was a long distance romance for eight years. In Shanghai, Li primarily taught flying and continued to be an example for women. For Chaing Kai-shek’s fiftieth birthday celebration she performed the first aerobatic flight by a woman. For the finale, she dove straight at the podium full of dignitaries and pulled up at last minute, just a few feet above their heads. Her popularity skyrocketed. In 1937 Japan invaded China. Li saw this as the ultimate opportunity to use her skills to serve her country. She was crushed when she was told she would no longer be allowed to fly because she was a woman, not even on courier missions. But she found another way to serve, by founding the First Citizens’ Emergency Auxiliary and using her own money to convert a hotel into the Red Cross Emergency Hospital. She was driven, doing everything from administration work to assisting with surgery to organizing a refugee camp and orphanage to running the radio station that broadcast propaganda. The Japanese were not so appreciative of Li’s contributions and they put her on their black list, forcing her to leave Shanghai. She ended up back in San Francisco where she started working on her idea to fly around the United States raising money to support China. She sold $7,000 worth of jewelry to buy an airplane and finance her excursions. Everywhere she went, Li was given a grand reception. Audiences were surprised and captivated by her beauty and style. The Idaho Statesman in Boise described her outfit of sharkskin slacks, no hose, leather sandals, finger and toenails polished to match the lipstick and a carnation behind her ear. This flower became her trademark. Hollywood noticed her, too. She revived her acting career as a Chinese aviatrix in the movie Disputed Passage starring Dorothy Lamour. She took time out of her flight schedule for the three-day job, and she did her own stunts, donating her earnings to the war refugee fund. By 1939 Li had flown 10,000 miles and raised $10,000 for Chinese refugees. She extended her efforts to two fundraising tours of South America, returning to Shanghai in May 1946. Back in Asia Li only flew for pleasure. She met international businessman Li GeorgeYixiang (no relation). Together they shared a love of travel, golf and horseback riding. They settled in Oakland near where Li had studied at Boeing. By this time, Li’s American pilot’s license had expired, and the Federal Aviation Administration would not recognize her license from Hong Kong. So, in 1966, at 54 years old, Li began flight instruction to become recertified. Li never lost the thrill of flying. One day while she was out driving, she saw a crop duster in a field. She stopped and asked the farmer if she could take it for a spin. She did tricks and aerobatic maneuvers, pushing the plane to its limits. When she landed, she thanked the flabbergasted owner and walked away. Li was 86 years old when she died in Oakland. For her final resting place she wanted to feel the same expanse she felt while flying. She had bought four adjacent plots in the Mountain View Cemetery and insisted that she be buried right in the center with lots of space around her. QUESTION: What nickname do people call you? What significance does it have? How has it influenced your relationship with them? Gully, Patti. Sisters of Heaven. San Francisco: Long River Press, 2008.